Grows to 100 ft. in height. Has 5-7 toothed leaflets per leaf; up to 12 inches long; without stalks. Buds are large and very sticky. Broken twigs do not have foul-smelling odor as the Ohio Buckeye has. Flowers are white (mottled red and yellow); flowering in May. Fruits are spiny or warty; produced in September-October. Planted in towns, horsechestnut is naturalized in the United States. The seeds contain various saponins including aescine, tannins, flavones, purines, starch, sugar, albumin, and a fatty oil. The bark contains coumarins, glycoside, resin and pigment. The name is derived from a famous Taoist priest, Chang T’ien-shih, who lived in Ts’ing-ch’en. Because of the high tannin content in horse-chestnuts, they must be shelled, crushed and leached overnight in cold water before they can be used. They are then strained and boiled for half an hour. The meal from the nuts is dried and used as medicine for humans or fodder for animals. The green outer casing of the fruit is poisonous and narcotic but the toxic principles appear to be neutralized by preroasting. Another chestnut tree (Castanea dentata) is also called horse-chestnut. It is not the horse-chestnut reported on here. Horse-chestnut leaves have marked narcotic tendencies, and a cupful of standard infusion will ensure deep, calm sleep. It should not, however, be taken too often despite the tonic properties it also enjoys. Essence of horse-chestnut is rich in vitamin K and therefore valuable in treating all circulatory disorders. People suffering from poor circulation, piles, varicose veins, and chilblains may be helped with medical supervision. Pealed roasted nuts were brewed for diarrhea, prostate ailments. In Europe, preparations of the seeds are believed to prevent thrombosis, rheumatism, neuralgia, burns, thought to help weak veins and arteries. Also used in bronchitis, swollen prostate, gastritis and gastroenteritis. Leaf tea is a tonic; used for fevers, colds, malaria, dysentery; externally, for lupus and skin ulcers. A fluid extract from the fruit protects against sunburn. 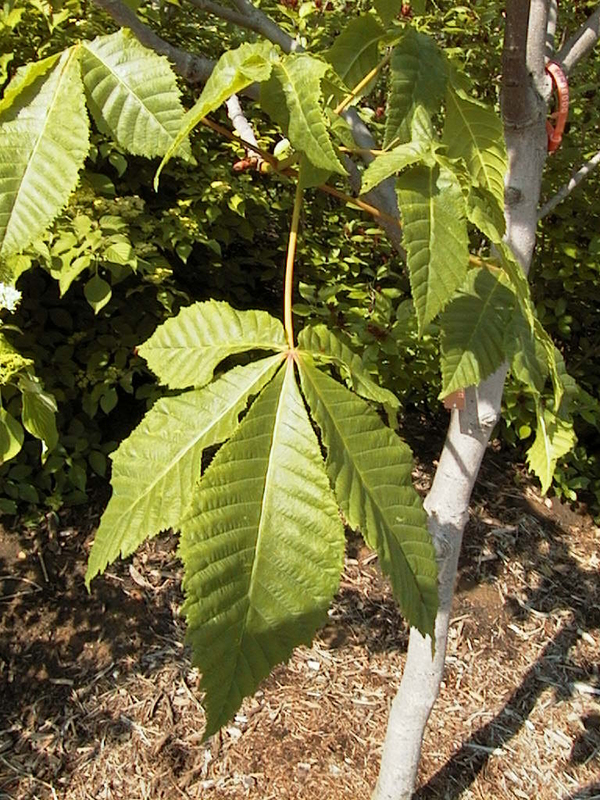 A related species: California buckeye (Aesculus californica) was reported to cause abortions in cattle. Although considered poisonous unless fully ripened and properly leached, it was used by the local Native Americans as a remedy for rheumatic aches and toothaches. The bark is boiled using 1 oz. to 1 pint of water. Not more than a tbsp. is given 3 or 4 times daily. The fruit is usually made into a liquid extract or tincture of which 5-20 drops are given 3 or 4 times daily. To make external applications: mix 1/2 tsp. of horse-chestnut powder in 16 oz. water. Apply the mixture gently to varicose veins or hemorrhoids. Do not rub hard; this could cause further irritation. Commercial preparation for external use can be found readily in Europe, but difficult to find in the United States. This herb is potentially fatal. Could cause death or other serious consequences. Although horse-chestnut has been found to be safe and helpful for some people under the guidance and care of trained clinicians, we do not recommend its use for self-diagnosis and treatment. Toxic symptoms include gastroenteritis, enlarged pupils, drowsiness, and flushing of the skin. Outer husks are poisonous. All parts can be toxic. Fatalities have been reported. Seeds (nuts) contain 30%-60% starch, but can be used as a foodstuff only after the toxins have been removed. Professional care is essential with this herb.